This entry was posted in On living and tagged holy Brigid, pray for us, Saint Brigid, The Life of Saint Brigid by janegmeyer. Bookmark the permalink. Be well, Jane. We are all just recovering from the flu too. I think Wyatt brought it home from camp and gave it to the whole lot of us!!! Friday is Iona’s feast day. 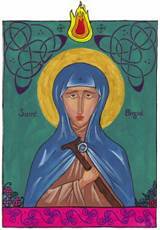 I’m trying to think of some ways to link up the celebration of St. Brigid with the eve of ‘Candlemas’. Should be interesting. . .
God heal your family quickly…..you are in our prayers. Love you all and sometimes smaller and slower is sometimes right were God wants us! Happy Feast! Xronia Pola!